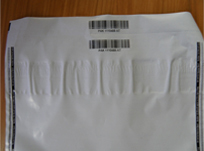 Tamper Evident Envelopes India, Tamper Evident Security Envelopes. 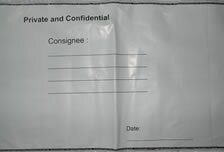 Tamper Evident Envelopes provides a high level of security for your business document and valuables. 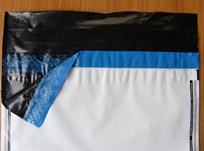 Made from super strong LDPE with hot melt self-sealing adhesive closure system, once closed any unauthorized attempts to break the seal will cause the VOID message to appear. A special double welding with fine print along the both sides of the edge to prevents spurious opening and resealing.. This ensures that there is absolutely no possibility of a loss/Tamper of Exam Papers/Material/Documents/Coupons in transit. 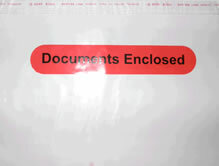 We can also print unique reference number along with barcode on the envelope which can be used to maintain a log or can be used for cross referencing. 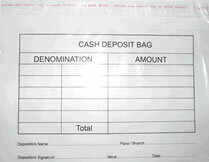 The reference number will be in ascending order wherein each envelope will have an unique number. This code number will be impossible to duplicate. These envelopes are polymer based, and hence they are 100% recyclable. As paper or wood pulp is not required to make this, use of these envelopes will help in preventing deforestation and thereby promote ‘Sustainable Development’ Thus, it will help your company in achieving its goal related to ‘Corporate Social Responsibility’ by using more environment friendly products. Envelopes can be tailor made according to the clients requirement all you have to do is drop a mail at admin@ethicalpolypaper.com & we will get in touch with you immediately. Opaque to maintain secrecy of documents inside. Writable with ball point or permanent marker pen. Can be serially numbered with barcode for record keeping. Courier Bags with pocket for AWB, and adhesive. A standard and accepted product. The additional features we can offer is unique numbers, barcode for tracking etc. 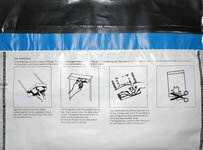 Can also suggest temper evident bags for confidential documents. For carrying special bottles, parcels etc while traveling. Comes with handle to carry easily. A special feature to give irreversible evidence of tampering. Can include security edge print on sides. Secure, temper evident, with tear-off receipt for accountability, water-proof and tear resistant, strong, can be made available with bar code and numbering. Once the cash is put in, sealed and signed by in charge, it becomes very easy and hassle free till further charge is taken by someone. © Copyright 2011, Ethical Polypaper PVT. LTD. All Rights reserved.